Kergan and Russ are adoptive parents to two boys in Orange County, CA. 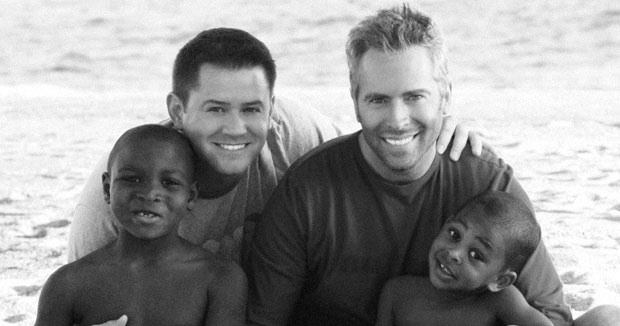 Mason,11, was adopted through a private agency, and Marcus, 9, was adopted through foster care. In 2011, Kergan was named one of HRC’s Fathers of the Year. I’d always known, even as a kid, that I would be a dad someday. I’ve always connected well with children–often better than with adults! As I grew older, the desire to parent became even stronger. I considered it at various points in my life, but after settling down with my now-ex partner, we decided we were ready to parent through a private adoption. When our son Mason was a year and a half, however, we broke up. I parented as a single dad for the next two years, until meeting my partner Russ. We went on to fost-adopt for our second child, Marcus. How did you decide to either biologically have a child or adopt a child? I never considered surrogacy. While I understand the desire some people have to biologically connect with their offspring, there are just too many kids out there who need homes now for me to seriously consider any other option. Did you share your journey with your family and friends? If so, have they been supportive? I’ve always been open of my desires to parent, so my family and friends were well aware. Still, when it came time for my first son to be born, and that he would be African American, there were a few issues which arose. Both of my parents are from the South, and very religious conservatives. We’d worked through most of the “gay” issues, but this situation brought up racial issues as well. I’m happy to report, though, that once my son was born, all issues disappeared. It is one thing to have intellectual prejudices, but they are no competition for having a real live infant in your arms. My folks are now amazing grandparents. What are some of the challenges you’ve faced raising children as a gay man? How have you overcome those challenges and what advice would you give new parents in a similar situation? We’ve had remarkably few issues related to our sexuality, and we live in fairly conservative Orange County. I can count on one hand the number of odd looks we’ve gotten. I think that is because we are a blended, transracial family, and couldn’t hide even if we wanted to. I make it a point to get involved with the boys school and often serve as Room Parent. I want others to see that we lead similar lives, and really there is not much difference between us. The issues we’ve faced have, for the most part, been the same others with kids face. Trying to maintain time for yourself when the focus is on the kids. Ensuring they do well in school. The challenge of balancing work/family/life. While I do anticipate we’ll face more issues as the kids get older and have to deal with anti-gay taunts, they’re currently in elementary school, so we haven’t gotten to that point yet. But we constantly talk about cultural differences and the need to respect others, even if sometimes that respect is not returned. So hopefully they’ll be prepared. Given that this was a longstanding goal of mine, I had done a ton of research prior to parenting. I’d gone to parenting conferences, joined the Pop Luck Club in Los Angeles, attended Maybe Baby classes, and used to regularly babysit my infant nephew, so felt pretty prepared for parenting. The hardest part was when my then-partner and I split up. I had envisioned we’d parent together, and had quit my job to be a fulltime stay-at-home dad. So the readjustment into being a single dad, and having to go back to work while also managing to raise a baby–not to mention dating–was a real challenge. Both adoptions were incredibly easy, with no setbacks. For Mason, his private adoption was very smooth, even though we lived in California and he was born in Tennessee. We connected with his birth mom through our social worker, and formed a great rapport. We flew to be there in the delivery room on the day he was born, even cutting the cord. My only issue with his adoption was the discrepancy in Tennessee law versus California. In Tennessee, two men cannot be listed on the birth certificate. And as we were all under my then-partner’s insurance, only his name is listed on the birth certificate. Which is a bit of an issue at times, given that I have primary custody. With Marcus, he was adopted at age 2 from the foster care system. His parental rights had already been terminated, so there were no complications. However, he had numerous medical conditions from both being born with club feet and poor nutrition, which had to be addressed immediately. He is now a really vibrant and active 9 year-old. What was the funniest thing that happened along the way? While not related to the adoption process, on the day of my 35th birthday, while changing then three-month old Mason, projectile poop flew out, landed on a space heater and burst into flames. Which seems a very apt analogy for parenting. No matter how valiant our efforts, poop sometimes happens. No way. Our kids are the best thing I’ve ever done. Our kids have taught me much about patience, which is an ongoing lesson. And every day their love fuels me, giving me the power to get through the day. I can’t imagine life without them. I think the biggest change was just going from having few responsibilities, to having many. We don’t have the flexibility, or the money, to just jet off for the weekend, as so many of our gay friends do. We have to plan ahead. And it is only now, as the kids are older and can play without the same degree of supervision, that I am finding time for myself. I put my writing on hold for many years, as my focus was solely on them, but it’s been rewarding to rediscover my creative side. How much did you budget for the process? How much did the process cost? These two adoptions were dramatically different. Mason’s private adoption was incredibly expensive, at roughly $30,000, given two states, travel, etc. Now, in addition to that, there were other costs with my second-parent adoption, which was the process in California at the time. (It has since changed and is much easier.) I won’t even get into the legal fees since my ex and I split! For Marcus, the fost-adopt process was barely $500 out-of-pocket, and the state gives a monthly stipend, as well as Medi-Cal, until the child is 18, so it was definitely the more reasonable financial option. How/Will you prepare your children to answer questions about their biological parent(s)? Our kids are fully aware of their heritage and backgrounds, and we talk freely about their situations, in an age-appropriate manner. As they get older, we give them more and more information, as needed, for them to fully understand their life story. And, depending on their desires and age, we are prepared for them to have some form of safe contact with their birth families. Would you be willing to share the name of the agency/other resources you used and why? As far as the attorneys we used, I didn’t find any one to be much better than the other. They all got the job done, and charged excessive fees to do so. For an adoption agency, I would highly recommend the Kinship Center. It is a non-profit and handles both private and fost-adopt. They give monthly informational seminars, which are very helpful for getting first-timer questions answered. They are also incredibly LGBT-friendly. At my first parenting class, which was held in an area I could consider fairly “redneck”, I was surprised to walk in and find that over half of the class were LGBT! They walked me effortlessly through the entire process–I can’t speak highly enough of them! I think that it needs to be more clear to people that parenting is not for everyone. Sometimes, I’ve seen LGBT people end up parenting because, as our rights expand state-by-state, they feel like it is the next step, or it is somehow a “trendy” thing to do, given the media coverage. But parenting is not something to be entered into lightly. It is incredibly hard, draining, and challenging. But it also offers rewards that nothing else in life can match. And for those who are truly up to the task, it is an amazing journey. I count my lucky stars every day for these two phenomenal kids. I am blessed. Kergan Edwards-Stout is an award-winning director, screenwriter, and author, having recently completed his debut novel, Songs for the New Depression. He is honored to have been named one of the Human Rights Campaign’s 2011 Fathers of the Year, and blogs regularly at www.kerganedwards-stout.com .